(Nanowerk News) Quantum chemical calculations have been used to solve big mysteries in space. Soon the same calculations may be used to produce tomorrow’s cancer drugs. Some years ago research scientists at the University of Oslo in Norway were able to show that the chemical bonding in the magnetic fields of small, compact stars, so-called white dwarf stars, is different from that on Earth. Their calculations pointed to a completely new bonding mechanism between two hydrogen atoms. The news attracted great attention in the media. The discovery, which in fact was made before astrophysicists themselves observed the first hydrogen molecules in white dwarf stars, was made by UiO’s Centre for Theoretical and Computational Chemistry. They based their work on accurate quantum chemical calculations of what happens when atoms and molecules are exposed to extreme conditions. 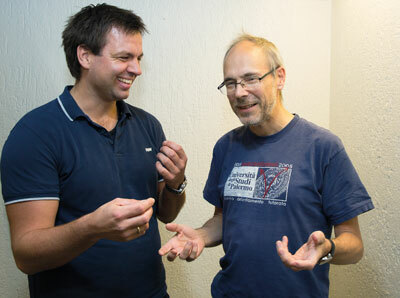 Quantum chemical models are used to form a picture of the forces and tensions at play between the atoms and electrons of a molecule,” says Simen Reine (left) and Trygve Helgaker, who for the last thirty years has taken the international lead on the design of a computer system for calculating quantum chemical reactions in molecules. The calculations are very demanding. “The Schrödinger equation is a highly complicated, partial differential equation, which cannot be accurately solved. Instead, we need to make do with heavy simulations”, says researcher Simen Kvaal. The computations are so demanding that the scientists use one of the University’s fastest supercomputers. “We are constantly stretching the boundaries of what is possible. We are restricted by the available machine capacity,” explains Helgaker. Ten years ago it took two weeks to carry out the calculations for a molecule with 140 atoms. Now it can be done in two minutes. “That’s 20,000 times faster than ten years ago. The computation process is now running 200 times faster because the computers have been doubling their speed every eighteen months. And the process is a further 100 times faster because the software has been undergoing constant improvement,” says senior engineer Simen Reine. This year the research group has used 40 million CPU hours, of which twelve million were on the University’s supercomputer, which is fitted with ten thousand parallel processors. This allows ten thousand CPU hours to be over and done with in 60 minutes. Thanks to ever faster computers, the quantum chemists are able to study ever larger molecules. Today, it’s routine to carry out a quantum chemical calculation of what happens within a molecule of up to 400 atoms. By using simplified models it is possible to study molecules with several thousand atoms. This does, however, mean that some of the effects within the molecule are not being described in detail. The researchers are now getting close to a level which enables them to study the quantum mechanics of living cells. By way of compromise they can give a detailed description of every electron in some parts of the model, while in other parts they are only looking at average numbers. Simen Reine has been using the team’s computer program, while working with Aarhus University, on a study of the insulin molecule. An insulin molecule consists of 782 atoms and 3,500 electrons. A complete correlated equation of the insulin molecule takes nearly half a million CPU hours. If they were given the opportunity to run the program on the University’s supercomputer, the calculations would theoretically take two days. Vice Rector Knut Fægri at the University of Oslo points out that quantum chemical calculations may become important to life sciences. “Quantum chemical calculations can help describe phenomena at a level that may be difficult to access experimentally, but may also provide support for interpreting and planning experiments. Today, the calculations will be put to best use within the fields of molecular biology and biochemistry,” says Knut Fægri. Associate Professor Michele Cascella at the Centre for Theoretical and Computational Chemistry has recently been recruited from Italy to introduce quantum chemistry into life sciences. “Quantum chemistry is a fundamental theory which is important for explaining molecular events, which is why it is essential to our understanding of biological systems,” says Michele Cascella. By way of an example, he refers to the analysis of enzymes. Enzymes are molecular catalysts that boost the chemical reactions within our cells. Cascella also points to nanomedicines, which are drugs tasked with distributing medicine round our bodies in a much more accurate fashion. “In nanomedicine we need to understand physical phenomena on a nano scale, forming as correct a picture as possible of molecular phenomena. In this context, quantum chemical calculations are important,” explains Michele Cascella. Professor K. Kristoffer Andersson at the Department of Biosciences uses the simpler form of quantum chemical calculations to study the details of protein structures and the chemical atomic and electronic functions of enzymes. “It is important to understand the chemical reaction mechanism, and how enzymes and proteins work. Quantum chemical calculations will teach us more about how proteins go about their tasks, step by step. We can also use the calculations to look at activation energy, i.e. how much energy is required to reach a certain state. It is therefore important to understand the chemical reaction patterns in biological molecules in order to develop new drugs,” says Andersson. His research will also be useful in the search for cancer drugs. He studies radicals, which may be important to cancer. Among other things, he is looking at the metal ions function in proteins. These are ions with a large number of protons, neutrons and electrons. Professor Einar Uggerud at the Department of Chemistry has uncovered an entirely new form of chemical bonding through sophisticated experiments and quantum chemical calculations. Working with research fellow Glenn Miller, Professor Uggerud has found an unusually fragile key molecule, in a kite-shaped structure, consisting of magnesium, carbon and oxygen. The molecule may provide a new understanding of photosynthesis. Photosynthesis, which forms the basis for all life, converts CO2 into sugar molecules. The molecule reacts so fast with water and other molecules that it has only been possible to study in isolation from other molecules, in a vacuum chamber. 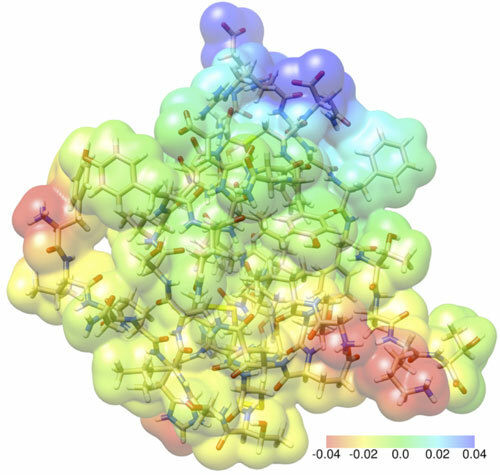 “Time will tell whether the molecule really has an important connection with photosynthesis,” says Einar Uggerud.